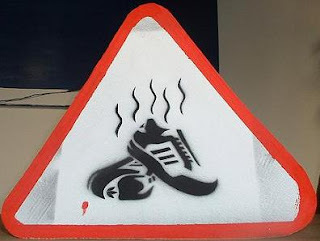 Smelly feet and virtues may seem to have little in common. A recent story out of Holland, though, indicates how they can be connected, at least for those of us who are philosophically inclined. We don’t make virtues that central anymore. For an American founding father like Benjamin Franklin, they were crucial. It was important to cultivate the proper habits for living a life in the service of good. Dispositions to act in patterned and appropriate ways, habitual practices that are not haphazard, but cultivated so as to become second nature, these were the virtues. One of the virtues listed by Franklin intersects with the story from Holland. The story involves a student. This particular individual was the target of complaint after complaint. Finally, the university decreed he be banished from lecture halls and the library. Why? Smelly feet. Yes, apparently the individual, a philosophy student sadly enough, made his presence felt by an immediate assault on the noses of his compatriots. Judge Oliver Wendell Holmes once famously declared “The right to swing my fist ends where the other man’s nose begins.” What happens when odiferous feet replace swinging fists? Is it now a case of “your right to the foot hygiene of your choice ends at my nose”? Students and administrators at Rotterdam University thought so. The banished individual thought otherwise. He went to court and the Dutch judge, rejecting the fist to face/foot to nose analogy, ruled against the university. Probably basing his position on a notion of absolute rights rather than the virtue of practical wisdom, (prudence is its traditional name) the judge said that “professors and other students will just have to hold their noses and bear it." The Dutch have a long tradition for upholding the virtue of tolerance. They also are a country of people known for cleanliness (the virtue high on Franklin’s list), and concern for others, the one sorely lacking in the smelly footed one. It is because virtues can often clash with each other that sensible judgment, prudence, needs to be invoked. At least, that is what the father of virtue ethics, Aristotle, taught long ago. He also pointed out that some kind of moderation is a trait that accompanies most virtues. Tolerance, for example, tries to strike the balance between completely open relativism on one end, and a narrow absolutistic imposition of a single strict mode of life on the other. Looking for some kind of legalistic wiggle room, the university now says that its moderate position will be to levy fines against those whose malodorous state wafts into neighboring noses. The model individual, for Aristotle, was not the iron-clad logician who applied general rules ruthlessly and without exception. 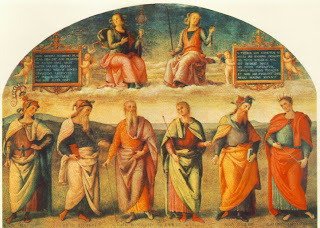 Justice and prudence, in the 15th century allegorical painting by Pietro Perugino share top billing, as if to emphasize how they have to balance off one another. Telling thugs that, yes indeed, the innocent young woman they seek is in a back room, may be the height of honesty. It is also an evil act. Rather than rigid machine-like application of universal dictates, prudential judgments seek the optimal realization of goods in particular circumstances. If they never give the absolute certitude that many humans long for, they do keep one dimension central, personal responsibility. Of course, humans like to skirt responsibility. They would rather claim to be simply acting in accordance with rules, following orders, or applying universal maxims to a concrete situation. Aristotelian prudence will have none of this. 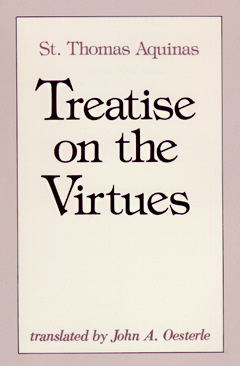 Rules and general principles are crucial in the practical exercise of virtue. They provide social guidance which, most of the time, works well. But, concretely, a conflict of goods, extenuating circumstances, the simple need for good sense, intervene. Then, prudence must be brought into play. Responsibility must be assumed. Judges, unlike Holmes who left wiggle room, may be constrained by a strict legalism. Universities, like the rest of us, are thankfully not.